PM Modi interacts with Loin Loom weavers. Loin Loom weaving of Arunachal Pradesh receives the much needed boost. 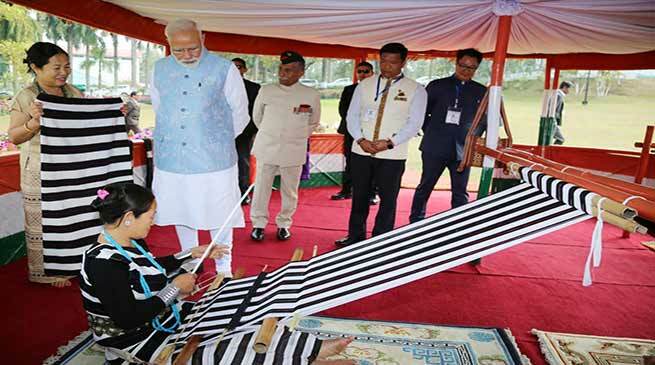 The Loin Loom weaving of Arunachal Pradesh on 9th February 2019, received the much needed boost, when the Prime Minister of India, Narendra Modi reviewed a set of loin looms set up in the Gazebo of the front lawns of Raj Bhavan in Itanagar. The Governor of Arunachal Pradesh, Brig. (Dr.) B.D. Mishra (Retd.) and Chief Minister Pema Khandu were present on the occasion amongst others. Interacting with loin loom weavers, the Prime Minister showed interest in methods of operating the indigenous loin loom. He enquired about the availability of threads for the looms. Loin Loom weaving is one of the indigenous artisan skill legacy passed down by womenfolk of Arunachal Pradesh from one generation to the other. The designs and patterns of traditional weaving of Arunachal Pradesh are unique, attractive, exclusive and one of its kinds in the world. Every tribe of Arunachal Pradesh has different colour and design symbolizing their identity. Loin Loom weaving is an extension of the traditions and has been a time tested self employment avenue for the ladies. March of modernisation and changing values are posing a threat to the Loin Looms family traditions and may lead to the disappearance of our tribal craft and severe the age old source of sustenance for the tribal ladies. With Prime Minister’s appreciation of the indigenous loin loom weaving, this art, craft and skill will definitely be adopted by the young ladies across the land of Arunachal Pradesh and more so the educated young girls as a hobby and tradition.